Fortress teacher Ms. Gabby leads the 3’s class in Circle Time. Fortress Early Learning Center began as a twice-weekly mother’s day out program for the moms who had grown up in Fortress Church. Building Blocks, as it was called, quickly evolved to meet the demand and needs of the neighborhood, and transformed from a daycare to a functional preschool focused on school readiness and social learning. After years of operating with a waiting list of 40+, Fortress opened a licensed, full-time preschool in 2016 and currently enrolls 60 children ages 18 months-4 years. Preschool students begin their day at 9:30am with a breakfast snack and circle time, where they employ Conscious Discipline practices such as greetings and “wish you wells”. Circle time includes songs, read-aloud stories, and routines that reinforce positive social habits, such as sitting criss-cross apple sauce, raising your hand, and listening to your teacher. Preschool students practice number recognition with a puzzle. Students then participate in centers, which include art, math, and pretend & play. Centers are child-directed and allow for creative interaction and exploration within the boundaries of teacher-developed activities. During centers, children also work one-on-one and in small groups with teachers on the early literacy and fine-motor skills needed for Kindergarten. Outside play is an essential part of our preschool environment. Fortress’s students enjoy a large courtyard complete with a sound garden, water table, sand box, tricycles and toys, and plenty of grass to run and play safely. After free play time, they enjoy a healthy lunch courtesy of our partnership with USDA program Purple Hearts. The day ends with quiet time/nap time, and children are picked up at 2:00. Students in the 2s room play “store” with each other. Preschool teachers utilize FrogStreet, a curriculum designed for intentional instruction to promote developmentally appropriate learning for each age group. FrogStreet uses weekly themes, such as “helpers & heroes” or “pets & animals” to bring learning to life for our young students, and incorporates math and reading concepts to prepare children to enter school ready and eager to learn. Fortress preschool teachers receive training for their CDA (Child Development Associate) and are mentored by experienced teachers in the field of early childhood education through our partnership with CampFire First. We are proud and thankful to provide this training to our staff, some of whom are current or former Fortress parents and have discovered a career they love through Fortress. 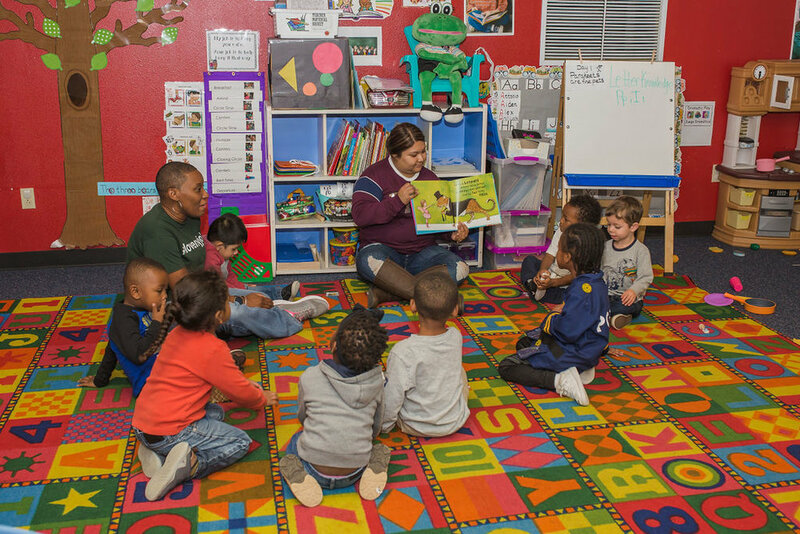 Like all of Fortress’s programs, Fortress Early Learning Center is offered free-of-charge. There is no zoning requirement, but preference is given to children who reside in or near Fort Worth’s Historic Southside. In lieu of tuition, parents and guardians complete 12 hours of parent engagement and participate in two annual conferences to remain eligible for re-enrollment. Fresh fruit and veggies are part of the daily meals provided to preschool students. A 4-year old student practices his shapes. Outside play is a great time to get out the wiggles and practice tumbling. Enjoying books, even before children can read, is fundamental to literacy. Two Fortress girls share dolls during centers. Dress up play is a fun part of exploring interests at Fortress ELC.